But I’ll save all of that for another blogpost shortly. One thing that was touched on over the weekend was creating the perfect opt-in that will attract the exact people you need on your list. And you need a list. Because your audience can forget to visit your website, they can forget to visit your FB page (which has virtually no reach these days anyway, thanks FB [not]), and they’ll probably lose your business card – but you can keep turning up in their inbox regularly and reminding them of how you can help. It’s NOT a numbers game. It’s about nurturing those relationships once they’ve joined you (because of your deliciously juicy opt-in). Having a highly-engaged small list is way better than having a list of thousands that delete your emails as soon as they turn up in your inbox. What’s the point of that? F’rinstance – I recently bought some bedlinen from a major retailer online; they automatically put me on their email list. They subsequently sent me THREE emails in the space of a week, all trying to sell me more stuff. Guess what I did on the third one? Yup. Unsubscribe. That was pretty silly, no!? They could have sent me a discount voucher, they could have sent me home decorating tips, they could have sent me all manner of useful information and kept me engaged; but no. They sent me more pushy salesly stuff. Yuk. But I digress. This is about creating a value-packed opt-in to get THE RIGHT people onto your mailing list in the first place. 1. Understand who your audience is. If you don’t know WHO you’re talking to, then you’ll have no idea HOW to talk to them, or WHAT you need to be talking about. Figure out who they are first, what they want/need, and how you can help them. Broad + general + covering all bases = VAGUE. Nobody finds that useful. Solve their one burning problem. For my opt-in, if you don’t know where to start with your branding and it’s all too overwhelming, I set out the basic foundations of what you need to do, so you can go through them step by step (if you’d like a copy of the Build Your Brand ebook, you can grab it here). I know you want to help them with everything (because that’s one of my biggest issues too! I want to give you guys EVERYTHING that’s in my head because I know how much it will help you). But in fact, too much information creates overwhelm, and overwhelm means that people simply abandon all that carefully crafted knowledge. No one actually wins there. Be succinct. Create something that’s simple to apply or do. 4. Make sure it’s on target with everything else you have to offer. While of course you’ve got lots of knowledge in different areas, don’t offer them apples when your business is all about oranges. Think about how they got to your page in the first place. You, for instance, likely came to my site because you were interested in figuring out how to brand your small business, and read a couple of my blog posts. The flow is then that my opt-in offers you more information about branding for small business. If I offered an opt-in on how to set up an auto-responder series in Mailchimp, while it’s still small-business related, it would be quite disconnected from the main focus of my website, and I doubt many people would opt in. 5. Make sure it’s clear how your opt-in will benefit those who sign up. Vague labels like “Sign up for my newsletter” aren’t going to cut it. The conversation in your audience’s head goes something like “What-the-hey for? What will I learn? What useful stuff will you give me that I can’t get elsewhere? Are you going to teach me stuff I need to know, or are you just going to be pushy and sell me stuff all the time? My inbox is already too crowded – why should I stick around?”. Tell them exactly the sorts of things that will help them get where they want to go. For instance, “Get small business tips and tricks”, or “Get free photos weekly” or a one-off specific thing like “Learn 20 ways to build better relationships”. 6. Keep your headline simple. Be specific and succinct about what you’re offering – if you have to take a paragraph to explain what your opt-in is, then it’s (a) obviously too complex and doesn’t solve the ONE problem (see points 2 & 3 above); and (b) ain’t nobody got time to read that. These things need to behave like billboards – grab your audience’s attention before they drive past. If the headline grabs them, then you give them a brief summary of what’s covered under that (dot points are good; or a single, descriptive sentence). 7. Make your opt-in button stand out on the page. Don’t buy into that rubbish about “red buttons convert better” – they don’t. What DOES convert the best is the button that contrasts with the rest of the page – so if your brand colours are predominantly red and orange, then make your button blue or green (and of course, make sure the colour still fits with your overall branding!). As Seth Godin says, “Show me where to click”. 8. After you’ve got them, keep them. After you’ve gone to all this trouble, make sure you nurture them. Give them useful stuff. Entertain them. Intrigue them. Respond to them when they write to you (and they will). Make them feel like they’re part of something. Make them feel like they’re part of your tribe. Love them hard. Give them stuff. Follow those 8 points and you’ll be able to build your tribe much more easily. However, keep in mind that even if you do those things to the best of your ability, they’re not bulletproof. They’re simply pointers, and you’ll still be spending time refining and tweaking your beautiful opt-in. But that’s OK! The long game is the only game in small business. Build relationships, and your audience will sing your praises. And that’s good for business. Hope I’ve made you think about your opt-in and now your imagination’s working overtime! 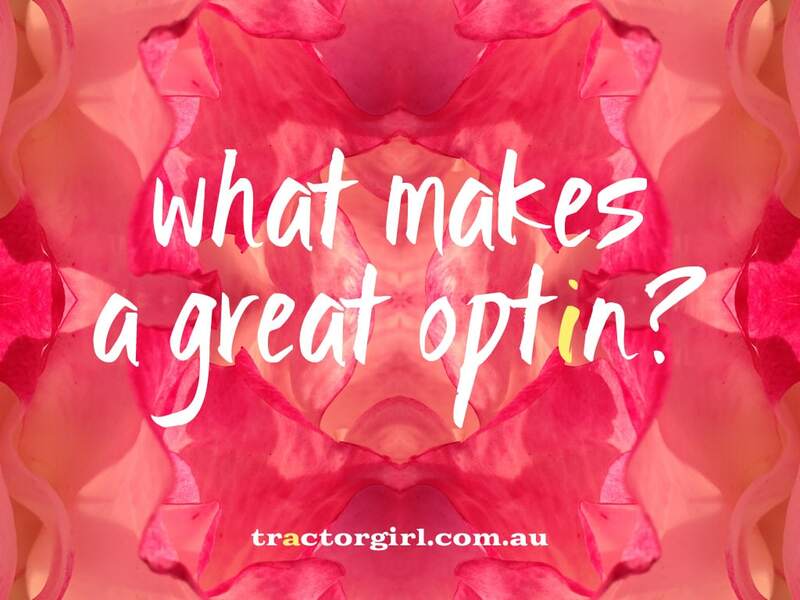 Have you got any questions about opt-ins? Pop a comment below, and I’ll point you in the right direction. So valuable, thank you. Certainly gave me clarity and the How-to steps. I love How-to steps!